The redcoats are coming, the redcoats are coming  to fight at a bar near you. Watering holes everywhere in the vicinity of Naval Station Mayport experienced a major boon in business this week after British sailors from the Royal Navys prized new carrier HMS Queen Elizabeth arrived in the northeast Florida port of Jacksonville Beach. Hundreds of sailors rambled off the ship Wednesday following a weeks-long journey that marked the 65,000-ton vessels first transatlantic voyage. And as is tradition with navies around the world, a pressing matter had to be attended to immediately upon exiting the hulking ship  the ancient mariner rite of drinking to the point of annihilation. With only a few days on land before heading back to sea, the Queen Elizabeths occupants stormed the beaches of Jacksonville ready to declare war and conquer any and all alcoholic beverages that stood in their way. The plight of understaffed service, however, wound up being on the lighter side of the evenings tribulations, as the number of alcohol-induced escapades inevitably soared Wednesday night and into Thursday morning. As any who have deployed or spent time on ship can attest, the accumulation of aggression while confined to tight quarters in the middle of an ocean can have a profound impact on the human psyche. This often manifests through booze-fueled skirmishes or other shenanigans when personnel find themselves liberated from the bowels of a floating prison and once more on the familiar environs of dry land. Its practically tradition, and the Brits dared not break from it. Doherty told the Times-Union he heard the number of such skirmishes were in the hundreds. All the angry people, where do they all come from? These tall tales were refuted by Sgt. Larry Smith of the Jacksonville Beach Police Department, who told the Times-Union that six Queen Elizabeth sailors had been taken into custody for drunken and disorderly conduct, which included public urination and fighting. Three sailors were charged with resisting arrest, and at least one needed to be tased. What would a Florida-based story be, after all, without at least one person necessitating a tasing? Fights with the host Floridians, meanwhile, were reportedly nonexistent, as the blokes from across the pond evidently managed to keep the raucous behavior to themselves. One complaint from bar and restaurant owners about the visiting seamen was nearly universal: tipping. International tipping customs aside, Smith said local police have had no additional issues since the incidents were first reported to the ships top brass. While these mishaps certainly dont make the best first impressions on locals, the concept of going a little overboard during a port visit is one familiar to many Americans. Just this year, at least six junior enlisted Marines from the 26th Marine Expeditionary Unit were busted down in rank for vandalism and drunk and disorderly conduct during a port visit to Gaeta, Italy, with the San Antonio-class amphibious transport dock ship New York. The mariner tradition must go on. 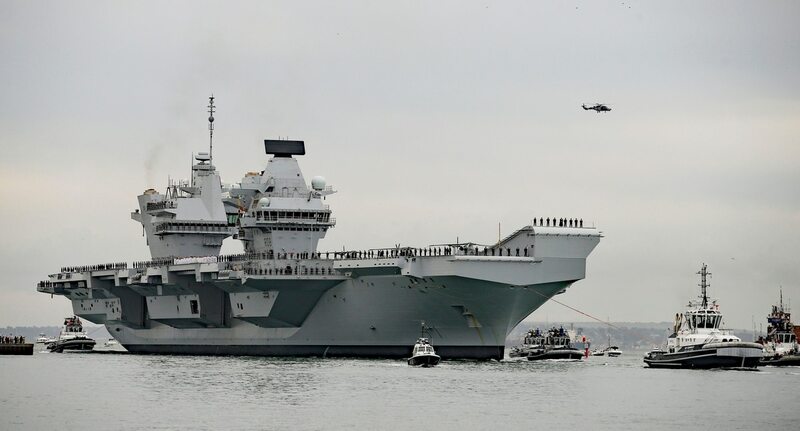 The carrier Queen Elizabeth, which left its home of Portsmouth, England, on Aug. 18, is next destined for Maryland, where two embarked U.S. F-35B Lightning II aircraft from Naval Air Station Patuxent River will make their first landings and takeoffs from the ships 280-meter deck. Heres to hoping bars in the land of pleasant living adequately prepare for the arrival of her majestys namesake. Allah's Limies from the president's FUKUS alliance. France, United Kingdom, USA. the president's FUKUS alliance. France, United Kingdom, USA. That's been the Western Alliance since World War I: France, the UK, the US. France was our first ally ever, and the key reason we're not the UK. Come on, this the very core of the Atlantic West. One cannot seriously be opposed to the US/UK/France alliance? It may as well all be one country, really, with Canada. This is very CORE of our civilization. one country, really, with Canada. This is very CORE of our civilization. There's a reason that Quebec never became a State. We don't want them! Rejected, definitely NOT Americans. They've forced Canadians to have bilingual soup cans, one side in French. 90% of Canadians hate Quebec and want to secede. Considering that a third of Canadians are Quebecois your number is a bit off. A lot of the people in Quebec would like to leave too. They are, of course, free to leave. Trouble is, Quebec's a great place to live.